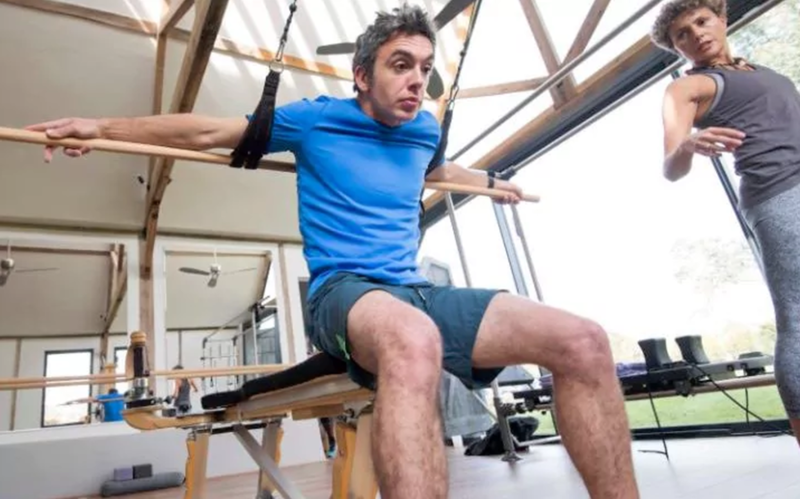 The GYROTONIC® method is a complementary exercise method that fall under one umbrella, the GYROTONIC EXPANSION SYSTEM®, an original and unique movement method that enables simultaneous lengthening and strengthening of muscles, stimulates circulation, and enhances joint mobility, and coordination. The method was developed by Juliu Horvath, an ethnic Hungarian, professional dancer from Romania. Horvath suffered a series of debilitating injuries during his dance career, and began developing what is now known as the GYROTONIC® Method as a way to heal himself and regain his strength and agility. GYROTONIC® is an exercise sequence composed of spiraling, circular movements, that flow together seamlessly in rhythmic repetitions, with corresponding breath. Each movement flows into the next, allowing the joints to move through a natural range of motion without jarring or compression. These carefully crafted sequences create balance, efficiency, strength and flexibility. Since the thirty plus years since Horvath began developing the GYROTONIC® method, the GYROTONIC EXPANSION SYSTEM® has grown to include a global community of over 13,000 GYROTONIC® Trainers teaching in 84 countries. All GYROTONIC® classes are highly accessible can be adapted to fit anyone's ability. The GYROTONIC® method is practiced by people from all walks and ages of life, including accomplished athletes and dancers, college students, baby boomers, senior citizens, and people with disabilities. GYROTONIC® exercises are performed on custom-designed GYROTONIC® equipment. IN STYLE Mag, "Gyrotonics, the New Celebrity Fitness Craze"
SHAPE Magazine: "We Tried It: GYROTONIC® | The unique training method that works your body in ways that no other workout can"
DANCE Magazine, "Star Quality Workouts"
WALL STREET JOURNAL, "Gyrotonics is a Workout That Helps Restore Mobility in the Spine"
THE GUARDIAN: "Murray's secret weapons: Gyrotonic exercise and cantaloupe melon"
THE TELEGRAPH: "How Pulleys, Levers, and a Former Dancer from Hungary Helped Andy Murray Climb to World No 1"
AZ CENTRAL: "Gyrotonic Vs. Pilates"
Jumping-Stretching Board Il Gyrotonic Expansion System® è un sistema unico di attrezzature e di esercizio che incorpora i principali movimenti dello yoga, danza, ginnastica, nuoto e tai-chi. Creato da Juliu Horvath, questo sistema allunga e rinforza i muscoli, mentre simultaneamente stimola e rinforza i tessuti connettivi interni ed esterni delle articolazioni. GYROTONIC® is a great way to rehabilitate from injuries as well as learn how to use the body in a healthy, efficient way. VIDEO: Rachael Ray drops by Kinespirit to try out GYROTONIC® exercise. After a little bit of time on the "jungle gym for grown-ups," Rachael LOVES it.